The concept of gamification has gained in popularity over the last few years. The concept has been introduced in various fields such as marketing, social networking, and learning. A whole industry is developing around this concept, often driven by self-proclaimed gamification “experts”. But for most learning stakeholders many questions arise: What exactly is gamification? How does it work? Is it really effective? Why? Let’s analyze the relationship between gamification and motivation and try to answer some of these interrogations through the perspective of learners’ motivation and success. There seems to be a consensus that gamification is the use of game mechanics in non-game contexts. In the instructional context, gamification is seen as a means to make learning more engaging by the use of features normally found in games to support learning materials. This definition is quite simplistic and also important in order to understand what gamification actually is, as well as distinguish game content from game mechanics. While the content of a video game includes the story, the characters, and the environment, game mechanics are the elements added to the content to provide a structure (levels) and reward accomplishments (points, badges, lives). Therefore, if we apply this definition to the instructional context, the learning content which includes presentations, simulations, branching scenarios, and exercises would be the equivalent of the game content. Therefore, gamification would only apply to the non-instructional material –the container– to create interest and engagement towards the learning content. Basically, the intent of gamification of instructional materials is to make them more appealing through the addition of game mechanics such as scoring, unlocking new modules, badge collections, and others. 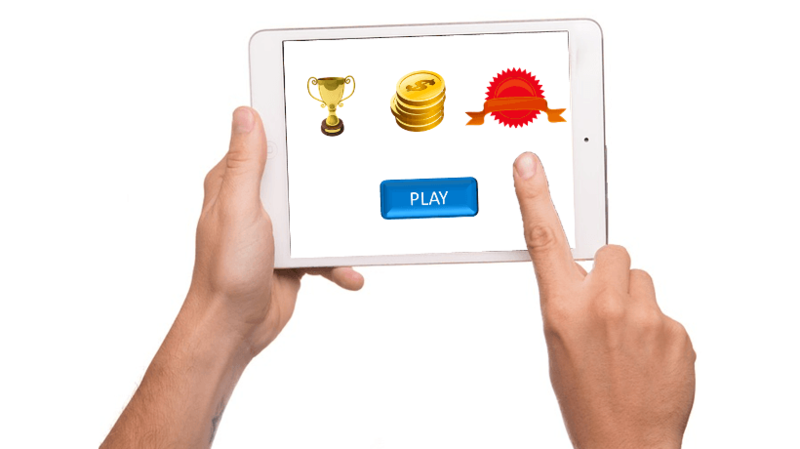 Since gamification implies the addition of game elements (such as points, levels, badges, and others) as incentives to use in a learning system, the key aspect of gamification is rewards aimed at providing extrinsic motivation to the user. Wikipedia defines extrinsic motivation as the performance of an activity in order to attain a desired outcome; it comes from influences outside of the individual. Common extrinsic motivations are rewards (for example money or grades) for showing the desired behavior, and the threat of punishment following misbehavior. Competition is an extrinsic motivator because it encourages the performer to win and to beat others, not simply to enjoy the intrinsic rewards of the activity. A cheering crowd and the desire to win a trophy are also extrinsic incentives. By opposition to extrinsic motivation, intrinsic motivation is the self-desire to seek out new things and new challenges, to analyze one's capacity, to observe, and to gain knowledge. It is driven by an interest and/or enjoyment in the task itself, and exists within the individual rather than relying on external pressures or a desire for reward. Students who are intrinsically motivated are more likely to engage in the task willingly, as well as work to improve their skills which will increase their capabilities. Students are likely to be intrinsically motivated if they attribute their educational results to factors under their own control, believe they have the skills to be effective agents in reaching their desired goals, and are interested in mastering a topic, not just in achieving good grades. In summary, gamification is the introduction of an extrinsic reward system (based on game mechanics) to non-game content (such as learning content) in order to engage and motivate learners to participate and complete the activity. Its use is intended to compensate the lack of intrinsic motivation towards a learning activity. Gamification And Motivation: Is Gamification Effective? Gamification vendors showcase the value of gamification, especially as a motivation tool to foster user engagement. However, research over the last few decades tends to demonstrate that, although such results may be observed, they cannot be generalized. Research shows that gamified systems return different results with different type of users. Regular users of gamified systems are mainly intrinsically motivated to use these systems. In general, most of them are not concerned about the rewards that a gamified system can provide; they use it to network with others, to learn about a subject matter, just for fun, etc. Gamification is based on principles of extrinsic motivation where students will indeed work harder for the reward, but ultimately gamification will detract from students’ intrinsic motivation to learn. Performance incentives offered to learners can adversely impact their perception of the task, or of their own abilities: Offering a reward to complete a task signals to the learners that the task in itself is undesirable. Otherwise, why would they need a reward? Overtime, after having benefited from the reward for a while, the learners will likely lose their intrinsic motivation and won’t do the task without a reward. Additionally, the satisfaction from the extrinsic reward will dissipates, requiring an increase in value of the reward. Rewards are then only weak reinforces in the short term, and become negative reinforces over time. Rewards may even encourage unwanted behavior. For example, targeting a speed badge may negatively impact carefulness. What Does That Mean For Instructional Designers? By fostering the use of gamification, Instructional Designers kind of acknowledge that their content isn’t compelling; otherwise why would they need to gamify it? Gamifying boring content does not make it more interesting or more relevant, it just makes it more interesting to use. What’s required is not bells and whistles to extrinsically motivate learners, but more relevant content to foster intrinsic motivation. Using gamification to make a boring subject matter more appealing, and using extrinsic rewards to compensate for low intrinsic motivation, is likely killing whatever intrinsic motivation to learn is left. So since there is little evidence, if any, that the use of gamification returns any significant performance improvement, the fact is that there is more to lose than there is to gain with gamification. The question is not to know whether gamification makes content more appealing or more engaging, but whether it makes it more effective. And based on the research to date, there is very little, empirical proof of the instructional effectiveness of gamification, at least in the mid to long term. So instead of trying to make the container more appealing, maybe efforts should be put on creating better, more inspiring, and more relevant content.